I recently got to spend some time with my wonderful Aunt Maryann at her home. Always the thoughtful and gracious host (and amazing cook!! ), she had prepared a delicious vegan spread for lunch, as well as homemade iced tea. She said her mother (my grandma, who is no longer with us) used to make it for her, my father and their siblings when they were children. I guess you can call this a family recipe! It was so good, I asked for the recipe to share! 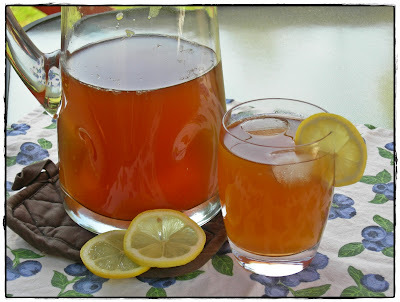 It's not really a complicated recipe, but it's so good and refreshing, and it sure beats the chemical laden iced tea powders at the store! Please see my notes that follow the recipe. Boil 5 tea bags in 6 cups of water. Once boiling, remove from heat and let sit for a few minutes. Remove tea bags & set aside. In a pitcher, combine 1/4 cup lemon juice and remaining 2 cups of water. Add boiled tea and combine. Add 1/3 cup sugar and desired amount of honey. Stir until dissolved. Cool in refrigerator, serve & enjoy! *I personally use decaffeinated tea bags. *I broke my "no refined sugar" rule with this recipe. But, realistically, although I'd like to eliminate it completely from my diet, that hasn't happened yet. A natural, homemade drink like this is okay by me from time to time! I use organic, pure cane crystals that are certified vegan. *Honey is not considered vegan. Some vegans use it and others don't. This recipe is just fine without it (which is how I made it). But I didn't want to eliminate that ingredient from the original recipe for those who choose to use it. 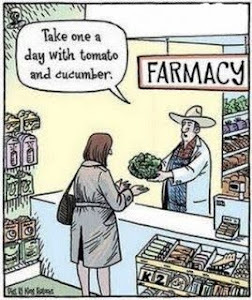 Buy organic! *When adding the boiled tea bag/water mixture to your pitcher, make sure it's a pitcher that can handle that type of heat! If you don't have one, you can mix all the ingredients in the pot you use to boil the water, and then let the pot sit in your fridge until the mixture cools enough to add to your pitcher. mmmmmm I love ice tea. I usually just pour boiling water over two bags of green tea, then add enough water to fill a 6 cup container and pop it in the freezer. It's soooo refreshing! But I'll have to try this recipe for something special :).Have you tried putting it into the freezer for a couple of hours? I love the super cold on a hot day! Hi Madame! I haven't tried that, I usually just put lots of ice cubes in the glass. :) I love it nice and cold on a really hot day too! Enjoy!